That pretty much sums up our offering at Rosary. 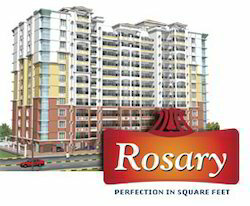 Built at the elite area Uday Baug near Hadapsar, Rosary is a bed of comfort and pure luxury. Well located in the midst of pristine landscaped surroundings in the heart of eastern Pune, it is meant to delight those who seek respite in greens that adorn its expanse. In close proximity of the city's BPO, IT and manufacturing hot-spots, it promises you the convenience of reduced commuting in an environment that will make you feel like you're on holiday. We offer you a range of carefully styled 3 & 4 bedroom super-luxury apartments that are endowed with world class amenities and top-of-the-line specifications. Welcome to the world of Aswani Rosary. To the east of Pune, just off the Pune Solapur Highway, well before you enter into the bustle of Hadapsar is a small, cosmopolitan suburb called Udaybagh. It is green and quiet, yet close enough to the busy malls, multiplexes and bazaars to make life convenient. Presenting Aswani Developers - founded on strong belief of perfection and personilisation, the company has grown into a well-respected name over the last decade. Aswani Developers has acquired a reputation of crafting ultra-refined residential and commercial spaces; visual delights, set within elegant surroundings, with state-of-the-art amenities. Personalised service, aesthetics and comfort are the constants that influence the Group's working practice and reflect in all its endeavors. Above all this is the appreciation, trust and support of our customers that inspires us to forge ahead with total commitment and zeal. Every Aswani home promises you a living space that's at par with international standards of quality. Our commitment to deliver the best can be seen in every square foot of your home.